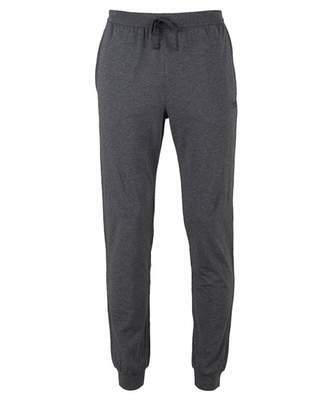 Relax in style with these cuffed pants from Hugo Boss. Featuring an elastic waistband with drawstring and ribbed cuffed bottoms. Two zip pockets run down both side of the pants which give space for your essentials. 70% cotton 30% polyester Elastic waistband with drawstring Ribbed cuff bottoms Two zip pockets Contrast waistband and cuffs Machine wash Size and Fit Size photographed: medium Rise: 13" Inseam: 29.5"